Gearbox needs to read a non-fiction book this summer. 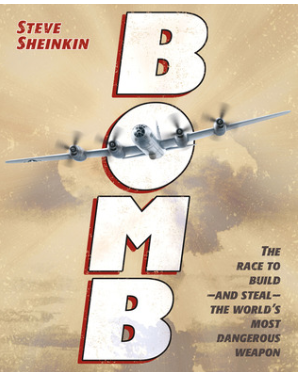 Being a huge Sheinkin fan, he picked Bomb: The Race to Build—and Steal—the World’s Most Dangerous Weapon. It arrived in the mail today and I immediately stole it and read it before he could get his hands on it because that’s the kind of mother I am. Bomb, like other Sheinkin books, brings an era to life in a way that is both fascinating and informative. Sheinkin has a rare gift; his non-fiction is as gripping as a novel you’d bring to the beach. The story follows three threads: the attempt to make the bomb, the attempt to keep the Germans from making the bomb, and the attempt by the Soviets to steal the bomb technology. This entry was posted in poetry, reading, reviews and tagged Ray Bradbury, Sarah Teasdale, Steve Sheinkin, WW2. Bookmark the permalink. The book is very well done. I’ve been to Los Alamos, read other books about that time, including ones by Feynman, and then the horrific Hiroshima. What a terrible time. I (is love the right word?) enjoy ‘There Will Come Soft Rains’, but I love all things Bradbury & this is certainly one of my favorites, have studied it with students too. Thanks for the poem, Katya. It’s sweet, isn’t it? Have you read The World Without Us? Fascinating! Such a weaving of texts you offer us today, Katya. This book is sitting on my nightstand, and you just moved it up the pile. You and Julie Larios are both pairing genres today – so spot-on and true. Finding beauty and making meaning from horror matters greatly. Happy PF to you and yours! A perfect pairing. I thought Bomb was such a powerful read for my sixth graders because of its varying perspectives. The Teasdale poem distilled the sense of awful loss beautifully. Hi, Katya. After reading your post, I have to recommend a great MG/YA historical fiction novel to your history buff. “The Green Glass Sea” by Ellen Klages, is about two children whose parents are scientists working on the atomic bomb. They live at Los Alamos. The history is terrific and Klages does not shy away from the conflict between the scientists, many of whom were against using the bomb they helped create. which helps me feel how pain is really endured alone, how wounds often do heal yet leave a scar. Fabulous post, Katya. Even more anxious to read the book now, and will have to look for Bradbury’s story. Sounds like a riveting book – and that Ray B. story is a classic. (I grew up on sci-fi and have always been a fan!) Never knew his short story was inspired by the poem, though. Excellent post. This Sara Teasdale poem is a keeper. In the Bradbury quote, he says, “The entire west face of the house was black, save for five places,” but then only four places are mentioned. Is it crazy that I noticed that? Just wondering about the fifth place. A pet? I think the fifth place is the ball, Tabatha? Loved the way Sheinkin pulled me in when I read BOMB. The two other texts you chose to go with it are, as everyone else has already said, perfectly chosen. I love Sara Teasdale.